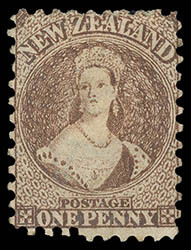 New Zealand, 1871, Queen Victoria "Chalon Head", 1d brown, perf 10, Large Star watermark, without gum, strong bright color, F.-V.F. Scott No. 38. SG No. 126 £900 ($1,240). 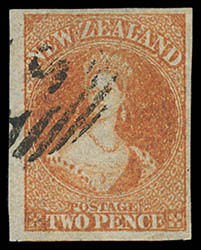 New Zealand, 1871, Queen Victoria "Chalon Head", 1d reddish brown, perf 10, partial double perfs at bottom, Large Star watermark, traces of o.g., well centered for this, strong bright color, Very Fine, an unusual perforation variety; with 2013 Odenweller certificate. Scott No. 38 var. Campbell Paterson No. A1n var. SG No. 126 var. £900 for normal ($1,240). 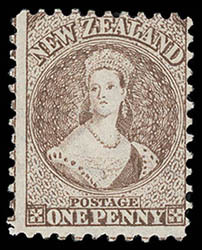 New Zealand, 1871, Queen Victoria "Chalon Head", 1d brown, perf 12½ comp 10 (1 side), Large Star watermark, vertical pair showing perf 10 at top and bottom only, barred "8" in oval cancels of Petre, rich color, slight foxing at top and right, otherwise Very Fine, still an attractive and rare multiple; with 2013 Odenweller certificate. Scott No. 42 var. Campbell Paterson No. A1p (X). SG No. 128a £400 for singles ($550). 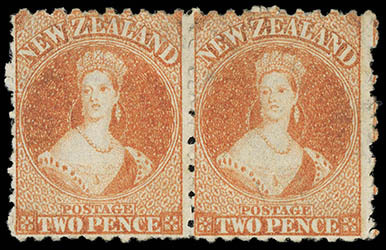 New Zealand, 1871, Queen Victoria "Chalon Head", 2d orange, perf 10 x 12½, Large Star watermark, horizontal pair, without gum, strong bright orange shade, Very Fine, a scarce unused multiple. Scott No. 43. Campbell Paterson No. A2r. SG No. 130 var. £600 for normal singles ($830). 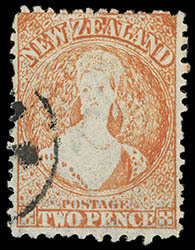 New Zealand, 1871, Queen Victoria "Chalon Head", 2d orange vermilion, perf 12½ comp 10 (1 side), Large Star watermark, showing perf 10 at bottom, plate II retouched position from row 20, no. 7 and sheet margin line watermark at bottom, neat circular face-free cancel, well centered with rich vibrant color, Very Fine; with 2014 Odenweller certificate. Scott No. 43 var. Campbell Paterson No. A2r (X). SG No. 130b £475 ($660). New Zealand, 1871, Queen Victoria "Chalon Head", 6d pale blue, perf 12½ comp 10 (1 side), Large Star watermark, showing perf 10 at top, very light barred oval cancel, wide margins, strong bright color, Very Fine and choice; with 1988 R.P.S.N.Z. and 2014 Odenweller certificates. Scott No. 44 var. Campbell Paterson No. A5j (Z). SG No. 131c £450 ($620). New Zealand, 1871, Queen Victoria "Chalon Head", 2d deep dull orange, imperf, Large Star watermark, left margin single, barred "5" in oval cancel of Campbelltown, ample to large margins, rich color, Extremely Fine, variety unlisted in Gibbons and unpriced in Campbell Paterson. Scott No. 40. Campbell Paterson No. A2s (3X). SG No. 133 var. Estimate $1,000 - 1,500. THE FINEST KNOWN EXAMPLE OF 1871 2D IMPERFORATE ON LARGE STAR WATERMARK PAPER - A GREAT RARITY WITH ONLY A FEW KNOWN. 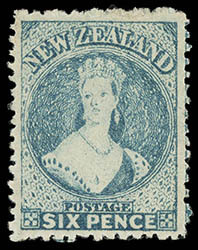 Two examples of this variety are illustrated in Odenweller "The Postage Stamps of New Zealand 1855-1873" with one bearing the barred "5" obilterator. 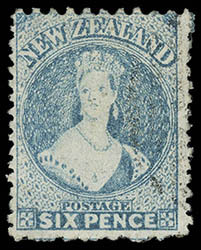 New Zealand, 1871, Queen Victoria "Chalon Head", 6d blue, perf 12½, Large Star watermark, full o.g., small hinge remnant, beautifully centered amid large well balanced margins, rich vibrant color and exceptional freshness, an Extremely Fine gem, a stunning mint stamp; with 2013 Odenweller certificate. Scott No. 41. Campbell Paterson No. A5k (2). SG No. 135 £325 ($450).